Burgess Marine Ltd and MMD (Shipping Services) Ltd, part of Portsmouth City Council, have opened a new ship repair facility using Flat House Quay in Portsmouth’s Commercial Port. The quay is over 100m in length and is dredged to a depth of 9m below chart datum. It offers both ‘flat water’ and 24/7 access to a 100tone crane. 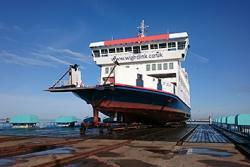 The first work for this new facility involved three-day alongside docking for Wightlink Ferries St Cecilia, which needed an emergency change out of a VOITH unit. By utilising the quay at MMD, the cranage alongside, and the skills and technical engineering experience of Burgess Marine the job was able to start immediately and be completed within the allotted timeframes and budget. St Cecilia operates on the route from Portsmouth to Fishbourne on the Isle of Wight. It was built in 1987 by Cochrane Shipbuilders Ltd, Selby, length overall 77.02m, beam of 17.02m and draught 2.48m., capacity for 771 passengers, 142 cars and a crew of 10-12. It has speed 12.5knots and 3 Voith Schneider cycloidal propellers. Burgess Marine has more than 30 years of ship repair experience, supporting both mechanical and structural repairs and refits to the commercial marine market, the defence sector and the superyacht industry in the United Kingdom and internationally. Its head office is in Dover and it has workshops and offices in Lowestoft, Dover, Portsmouth, Portchester, Hythe - Southampton, Avonmouth, Devonport and within STP (Servicios Tecnicos Portuarios) Palma. The business operates two Syncrolift facilities; one in Portchester, rated to 1000T and one in Cherbourg, Northern France rated to 4500T.